The Lolo Peak Fire was ignited by lightning in mid-July and has since burned more than 34,000 acres, prompting hundreds of evacuations and destroying two homes and several outbuildings. One firefighter was killed working the fire on Aug. 2 when he was struck by a falling tree. As of Thursday, the blaze was 14 percent contained. By Aug. 25, the Rice Ridge fire north of the town of Seeley Lake had grown to nearly 18,100 acres and was just 16 percent contained. Daines echoed that sentiment, saying that the Libby Loggers — the mascot of the school in Libby, Montana — could be renamed the “Libby Lawyers,” apparently implying that the town’s timber mills have been replaced by lawyers working for “extreme environment groups” fighting to stall and stop efforts to clear dead and dying timber. In June 2015, when still a Montana congressman, Zinke introduced a bill to limit what he described as “predatory lawsuits funded by out-of-state special-interest groups” against timber projects on U.S. Forest Service land. The bill would have required a plaintiff to post cash bonds to cover the Forest Service’s defense costs, with the plaintiff getting the money back only if it proved victorious. Removing dead trees and thinning forests are common tools for helping to prevent wildfires. But scientists have shown climate change is driving up temperatures and triggering longer wildfire seasons in western states. 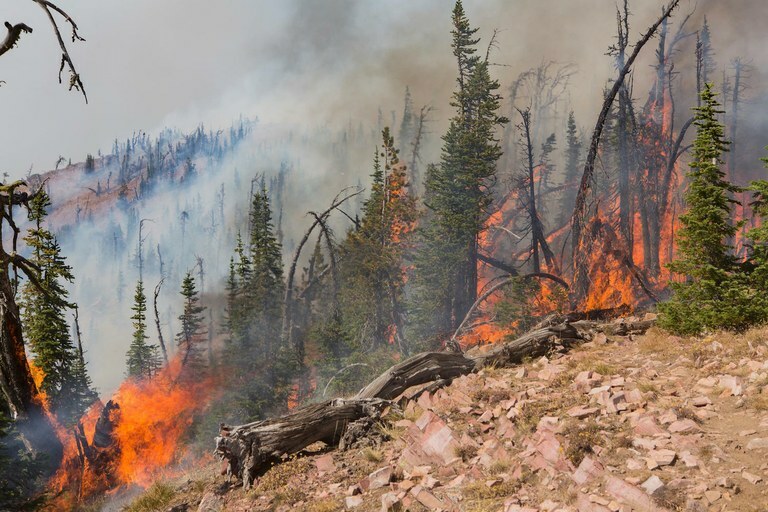 Last year, researchers from Columbia University and the University of Idaho found that climate change has been fueling wildfires in the western United States for decades. As HuffPost previously reported, President Donald Trump’s proposed 2018 budget calls for a $300 million reduction to the U.S. Forest Service’s wildfire fighting programs, another $50 million in cuts to its wildfire prevention efforts and a 23 percent reduction in funding for volunteer fire departments. Asked Thursday if climate change has anything to do with the intensity of fires in recent years, Perdue said there have also been major fires in the eastern part of the country at certain periods of time. “There obviously is climate change, temperature change, weather change. And we have to deal, we have to adapt to it. And we have to manage the forest,” he said. In an apparent attempt to dismiss the role of climate change, Daines pointed to the Great Fire of 1910, which “burned three million acres (in Montana and Idaho) and killed enough timber to fill a freight train 2,400 miles long,” according to the Department of Agriculture. Trump and several members of his Cabinet have dismissed the threat of climate change and the role humans are playing in driving up global temperatures. And the administration has worked expeditiously to derail America’s actions to combat climate change and roll back environmental regulations. Environmental Protection Agency head Scott Pruitt and Energy Secretary Rick Perry have denied the role carbon dioxide emissions are playing in driving climate change. Zinke has said glaciers in Montana’s Glacier National Park started melting “right after the end of the Ice Age” and that it has “been a consistent melt.” He also dismissed the notion that government scientists can predict with certainty how much warming will occur by 2100 under a business-as-usual scenario. Listen to the full press briefing here, recorded by Newstalk KGVO.